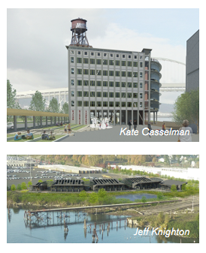 Projects on the Willamette North Reach will go on exhibit beginning June 9, 2011 through June 16, 2011 at Portland City Hall. Located at 1221 SW 4th Avenue on the First Floor Public Area and open during regular business hours, the exhibit will hold a public Reception on Friday, June 10, from 4:30pm to 6:30pm. The exhibit is presented by The Urban Projects Workshop, part of the University of Oregon, Department of Architecture Portland Program. This exhibition is a selection of University of Oregon graduate student design thesis projects from the Department of Architecture’s Portland Program. The project is part of a two-year collaboration with the City of Portland’s Office of Healthy Working Rivers. 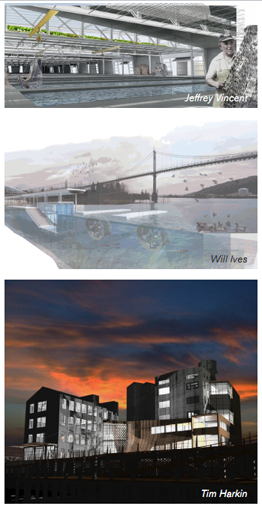 This year’s projects focus on the “North Reach” of the Willamette River. Next year, projects will move to the “Central Reach,” currently under planning study by the City. The work builds on the urban planning framework established by the City of Portland’s River Plan | North Reach by developing urban design and site-specific illustrations of potential development opportunities, connections to adjacent neighborhoods and open space connections along the river edge. The goal of the design studies is to help the city of Portland, private industry, property owners and residents of adjacent neighborhoods envision future redevelopment of the riverfront during the coming years. Studies focus on three clusters along the North Reach: St. Johns, Swan Island and Northwest Portland (northwest of the Broadway Bridge). They illustrate industrial, research-development, education training and public places that have potential to transform the Willamette River edge into a high value, attractive riverfront where industry, residential neighborhoods and recreation coexist and thrive. Specific projects include a manufacturing plant for technically advanced water turbine generators, an incubator industrial complex, an aquaculture demonstration and production facility, research and development centers, an Oregon Brewing Center, and a public building on the St. Johns waterfront. The studio also contains four projects in Seattle and Bainbridge Island, Washington, San Francisco, California and Detroit, Michigan. These projects provide comparative study opportunities of design precedents that stimulate thinking about the potential of the Willamette River in Oregon. During the past thirty years, Portland removed the Harbor Freeway on the west bank of the Willamette River to create Tom McCall Waterfront Park, built new mixed-use residential neighborhoods at Riverplace, the River District and South Waterfront, sponsored new waterfront public buildings such as OMSI and the Water Pollution Control Lab, and designed impressive recreational projects such as the East Bank Esplanade. With the impending environmental remediation projects and foundation established by the River Plan, Portland has potential to transform the Willamette riverfront to create the strong urban focus and “seam” envisioned by previous citizen and city planning efforts. For more information, please contact Professor Gerry Gast, University of Oregon, Department of Architecture Portland Program, ggast@uoregon.edu. The University of Oregon in Portland is located at the White Stag Block, 70 NW Couch Street, Portland, Oregon 97209.